Sweeping views set the scene for a relaxing adventure at Peaceful Hills guesthouse. Thoughtfully appointed, this guesthouse offers many amenities that you will certainly appreciate. 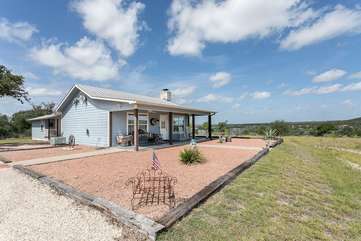 The large front porch with rockers and an unobstructed view is a perfect place for watching sunsets, wildlife and stars. Spacious and light filled, the living room offers a comfortable place to sit and enjoy the fireplace. The custom made mantel echoes the name of your private getaway. A corner of the living room offers a kitchen with coffee maker, microwave, toaster, and refrigerator. The satellite television is found in the living room for your enjoyment. Please note, the fully refurbished wood-burning stove is for decoration only, it is not available for cooking. An antique cupboard houses numerous family treasures. Special attention is given to the luxurious bath. A large heart shaped whirlpool tub has nothing more than extravagant romance in mind. Your hostess specially chose a wonderful painting of a Victorian woman bathing, reminding you to relax and enjoy simple pleasures. The separate shower is also available. Full of fresh country inspiration, the bedroom has a king sized bed topped with a lovely lavender quilt. The satellite TV is placed to enjoy watching from bed. An antique dresser gives a sense of old fashioned charm. Our 4th time there. We love it and will be back. We had a great time at Peaceful Hills, mostly due to the excellent preparation of our hosts. We had everything we needed. Even though the weather was rainy & cold, we had a wonderful fire going in the fireplace, great TV programming, lots of goodies for snacking, and comfortable seating for relaxation. Ursula could not have done anything more to make our stay one we will long remember! We had a wonderful birthday weekend at Peaceful Hills. The hosts thought of everything- tasty treats for breakfast, snacks, juices, homemade butter and jams, fresh bread- you name it, it was there!We loved sitting by the fire (plenty of firewood was provided) and had a lovely stay. We loved the giant heart shaped tub, and again, the hosts thought of everything we might need when it came to toiletries. Very peaceful, as it is a bit away from downtown Fredericksburg, but close enough that we could go to town easily. We will always cherish the memory of our weekend in this wonderful place! As always, Peaceful Hills was immaculate and comfortable. We enjoyed ourselves immensely! Our stay at Peaceful Hills couldn't have been better. This lovely cottage was beautifully furnished, tastefully decorated, and adequately stocked to fit our every need, and then some. The Owners' thoughtfulness is abundant in every room. We have already recommended Peaceful Hills to friends. We thoroughly enjoyed our stay. A very nicely done property with a peaceful, scenic location. My wife and I planned a weekend getaway to Fredericksburg to go to Oktoberfest. This property is 15-20 minutes from the Marktplatz so convenient enough for us but far enough to escape the crowds. We loved coming back to such a peaceful, scenic cottage. It is well appointed and clean. We would definitely come back to stay another time. Peaceful Hills is Absolutely That! Beautiful country setting! We have stayed here several times over the years and we always have the most amazing get-a-way and renewal at Peaceful Hills. We love the country views. The home is always nice, super clean and comfortable. Deer come up to be fed in the evenings and Ursula leaves us a bucket of feed for them. Pretty Girl, one of the deer that they raised and is so tame that she came up and licked my knee while I was sitting on the porch. We also got to see several newborn baby deer. We love this place. We believe it is our favorite place to stay in Fredricksburg and we have stayed at many other places over the years. Peaceful Hills is Excellent!!!! The peaceful hills was an amazing house for my wife and I. We enjoyed the serendipity and quick drive to downtown Fredericksburg. We had such a great time celebrating our 6th month anniversary! Located about 10-12 miles from Fredericksburg, this B&B was quite a bit farther from town than what we usually choose. However, it was well worth the extra few miles!! Very, very charming! The soft lights & nice music playing upon our arrival Friday night were a nice \'welcome\' after a long workday and almost 3-hr drive. Lovely accommodations, super comfortable bed, delicious breakfast pastries & breads, and a beautiful view from the porch rocking chairs all awaited us. \"Peaceful Hills\" is a perfect name, as it describes this place perfectly. We enjoyed it so much and were so relaxed here that we, basically, had to force ourselves to leave and go into town to get the whole Fredericksburg \'experience\'. We usually visit Fredericksburg 2 or 3 times a year, & will definitely book this place again. We loved this place! Beautiful views from the front porch! The house is beautifully decorated, and very cozy! Only minutes from Fredericksburg. We will be staying here again on our next trip down south.